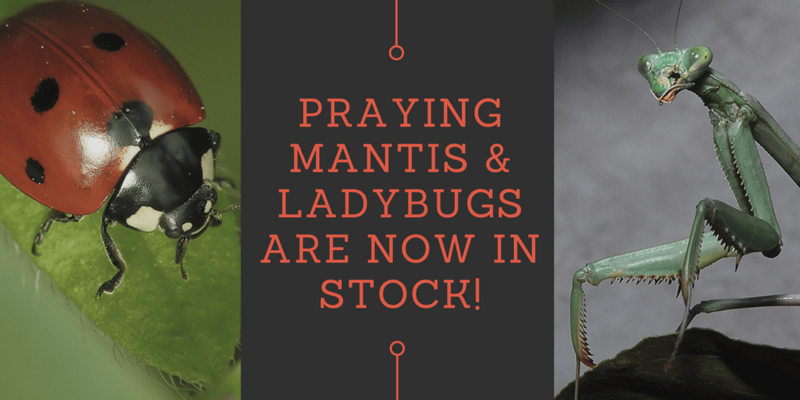 Don’t forget to get your beneficial insects! Great Eco friendly way to get rid of bad bugs and to help pollinate your veggie gardens and fruits. USE: Praying Mantids eat a wide variety of garden pests. 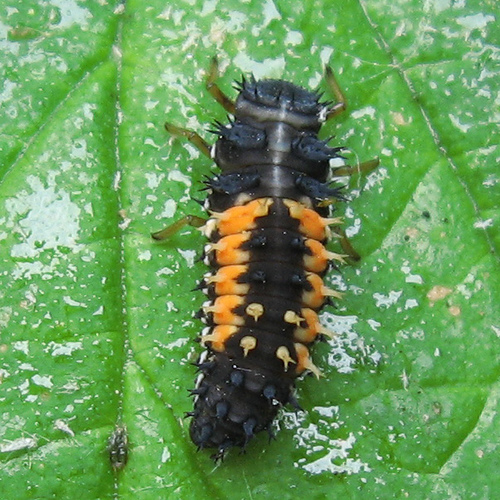 In their younger stages they eat aphids, thrips, flies and maggots, small caterpillars, leafhoppers, white grubs and other soft-bodied insects. Mature Mantids feed on larger caterpillars, earwigs, chinch bugs, sow bugs, beetles, grasshoppers and other large insects. LIFE CYCLE: Praying Mantids (Tenodera sinensis) hatch out of their egg case (ootheca) along the seam that looks like louvered windows with some mud packed on top. They hatch in the spring when the weather warms, the warmer the temperature, the sooner they hatch. Unlike most insects the mantids do not hatch as larvae, they emerge as miniature adults, about half an inch long. They will grow through spring and summer until they reach a length of 5 to 6 inches, shedding their skins several times. Although mantids have wings, they do not use them until fall when the female wings develop and she begins flying around looking for males to mate with. After mating, she eats the head off the male, which helps to nourish her eggs. She then attaches the brown foam to a branch, lays her eggs inside, and dies shortly afterward, The eggs are protected from the winter cold in the foam and the cycle begins again in the spring. GENERAL INFORMATION: When the eggs hatch the egg case does not change in appearance except for what looks like a little sawdust hanging from the seam. Since the Mantids do not move much and blend easily with their surroundings, it is easy to miss the hatching. While most insects are constantly searching for food, Mantids are content to stay in one area and wait for their food to walk by and grab it with their strong forelegs. This is why they are good to use early in the season, before there are pest problems, and use other insects after pests arrive. Boost your garden’s productivity by providing a happy home for peaceful, non-stinging Mason bees. Slightly smaller than honeybees, mason bees are incredible pollinators. Each one visits as many as 1000 blooms per day — 20 times as many as a honeybee! 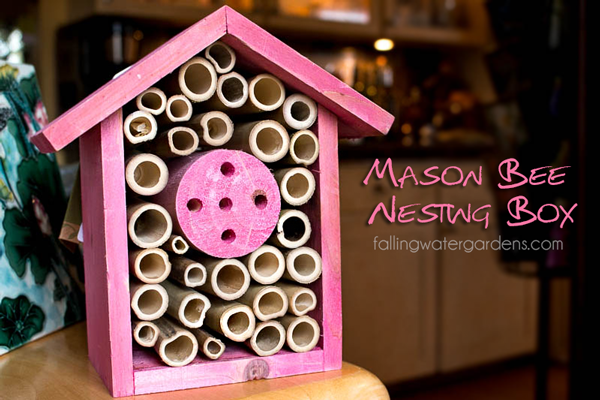 We have a variety of mason bee houses to choose from! 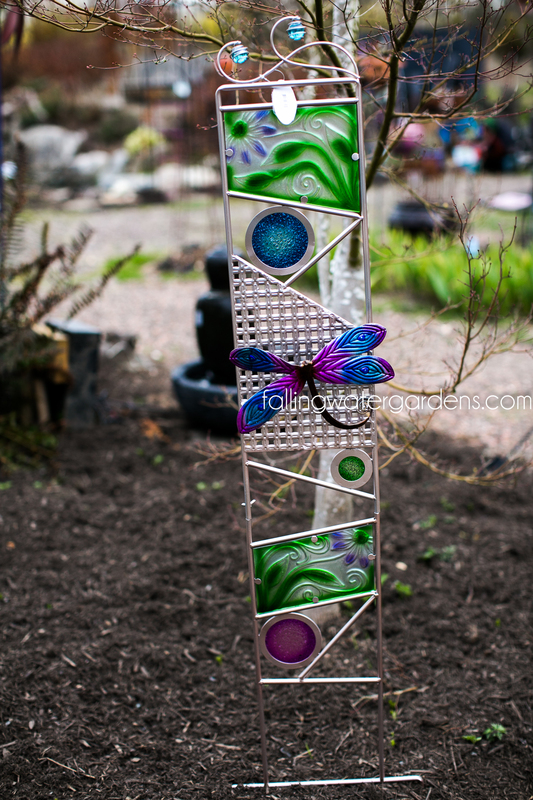 Create a fun and festive atmosphere in your yard or other grassy area with the Decorative Metal Flower Stake. This gorgeous floral garden stake is topped with a big bright blossom that is sure to make an impact wherever you choose to display it. Available in bright pink or bright blue. $34.88. Ideal for a warm summer evening, this large Wildlife Fire Globe Fire Pit adds light, warmth, and an exciting ambiance to every party. An enchanting backyard focal point with or without fire! $564.88. 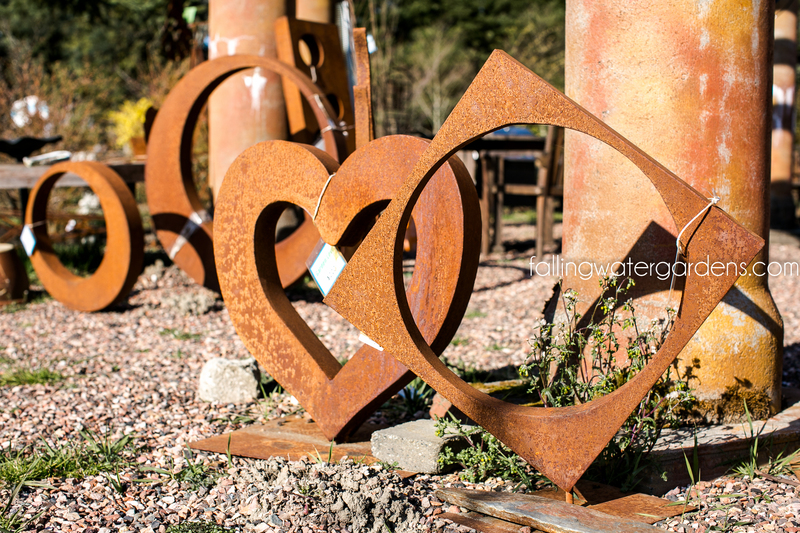 Give your space a little more flair with one of our rustic art pieces. We have a wide variety to choose from. Come visit Falling Water Gardens and see the assortment of trellises throughout the gardens. $72.88. 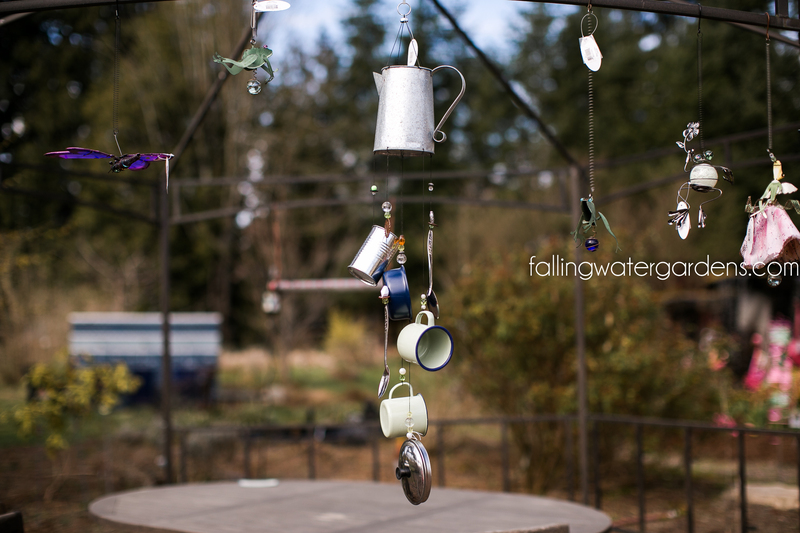 Liven up any gathering with this conversation-starting Pots and Pans Wind Chime. $27.88. Picture yourself enjoying a nice lunch, afternoon tea, or cocktails for two seated at this stylish outdoor Slate Bistro Table. The elegant design will give a fresh new look to your outdoor living space. $268.88. Birdbaths made from impressive boulders blend naturally into any landscape. Invite sweet birds to your backyard for a cool drink of water. $220+.